Dingo Mini Rawhide Bones are premium, hand-tied chews with the irresistible combination of real chicken breast jerky wrapped in the highest quality rawhide. The delicious flavor, satisfying texture, and natural ingredients have made Dingo Bones a time-tested dog favorite. Buy in bulk for even more savings! Fantastic product from the best brand Dingo. 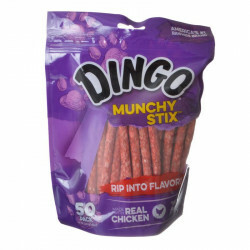 Our dogs gobble Dingo Mini Bones these up! My dogs can't get enough of these... I leave them one every morning when I go to work. It definitely gets them distracted so they don't mind as much that I am leaving. My Odie loves these so much I have to hide them as he will try to help himself to them. They are priced cheaper than department stores when purchased in bulk. I am so glad to have found Pet Mountain. My dogs love these. They get one every night. However my last few shipments there have been at least 1 bone in about 4 of every 5 pkgs they won't touch. Something is not right with bone neither dog will touch it, not sure what's up with that. Give them a different one and it's ok, so not sure if there is something in the production of them or what. It's just been the last few months. Just what I ordered, dog loves em. Our Sheriff's Office Lieutenant has me order these Dingo bones for his K9 partner Keto. Keto gets one on every off day as his treat and he really loves them. My dogs love these. They are definitely a favorite! Our Scotties love getting Dingo bones and we love getting them from Pet Mountan. Great price and fast shipping keeps them in Dingo bones. Our dogs love these. They are easy to order at Pet Mountain and are a good price. Just as in the first review, you got it right on first try, I will be back as a customer. A great dog treat that my dog enjoys plus it is beneficial in keeping teeth clean and breath fresh. My dogs (a pit bull/sharpei mix and a boxer mix) love these and I like them because they are hard enough to give the dogs a nice chew but not so hard or tough as to be a problem for older dogs' teeth. My daughter, who has 8 dogs, also recommends them. 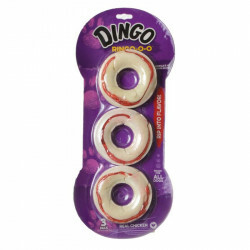 Both of my 6 yr old pups must each have two Dingo Minis every evening after dinner. It satisfies their crunching, gnawing needs and they cannot get enough of the meaty insides. They will not go to bed without first having these. We had been buying this product for several years now. Our dogs love it and they couldn't eat anything else! Just wanted to let you know that this is the best price per piece I found anywhere. PetMountain always seems to have the product in stock and I usually buy 6 bags so I get free shipping too. Dingo is the only chew bone I buy. Pet Mountain's price is almost half of any local pet store. They make ordering easy and shipping/handling is great. I'm so glad I came across their website. You won't be disappointed. Large is perfect for a medium dog! My basset and cocker had a large Dingo bone and it lasted all day long. The two of them have enjoyed snuggling up in their blankets and chewing their Dingo bone. Also, I was so afraid it would cause loose stools, but no. All is right with the "Dingo world." They are a bit expensive though. Our Dogs Love These Too! If you've got a "Good Shepherd" like our Cagney, you know how quickly they can devour any treat! While just one large Dingo rawhide chew keeps Cagney happily occupied for up to 20 minutes, it can take Suzy (our "Spoiled" Rottweiler) almost an hour to devour hers!! We've been buying these Dingo bones for our 'girls' (Black Lab, Appenzell Mountain Dog) ever since they were tiny puppies. They're now ages 3 and 2 and they still love these rawhide bones. We love them because these bones satisfy their urge to chew. Petmountain is our go-to online store for all our 'girls' treats and toys. Their prices are the best and the free shipping is icing on the cake! Excellent product; excellent price; excellent service. A great price for a treat that is much enjoyed by our dog. We give our two yorkies one each morning. Great for keeping their teeth clean & healthy. The product we ordered was exactly the same as in the store, but at a significantly less price. The free shipping also made a difference. We live in Alaska. The normal "FREE" shipping in many cases does not apply to Alaska and Hawaii. It was great to see this merchant's free shipping applies to ALL states. The best bones ever. We have 7 dogs and they try to steal them from each other. This site has the best prices!! My dog loves these and goes through more than a bag (21 count) a month. I save a lot of money when I order in bulk from Pet Mountain -- great prices and ships quickly. This is an excellent price for Dingo Bones. I did a lot of research because our big dog eats about one a day. You won't find a better price! The shipping and service were great. What more can I say. 5 Stars. Dingo Rawhide Chew Bones - GREAT!! Our "girls" have been chewing these Dingo rawhide bones since they were puppies and they love them. Our two "girls" are big (105 & 67 pounds) aggressive chewers and these bones keep them happy and busy for a good while. Petmountain has the best price, delivery, and customer service, hands down! 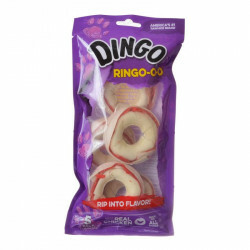 Try these Dingo bones; you will not be disappointed. My doggie can't get enough of these treats. She enjoys eating them and playing with them. I can not keep enough supply of the Dingo Mini Rawhide Chew Bones for my Yorkies. They absolutely love these! The prices here are the best! My dog loves these -- has to have one every night or she mopes around. They are more expensive in the stores and often out of stock, so I ordered 10 bags, saving money and hassle. The shipment arrived quickly too. Great deal on Dingos. My pup loves them and it's the best price online. My dog love these Dingos! She scours the floor for crumbs. These are my dog's favorite, but they're SO expensive everywhere else. These are an amazing deal here - especially when you order enough at one time for free shipping! Thanks pet mountain.com - you've earned a loyal customer! Great product and steal price! My dog love this treat... she so enjoys chewing it and it helps with her built-up. My dog LOVES Dingo brand rawhide chews. These are great for him when I'm gone short amounts of time. The price value is awesome!!! These are great treats. They have real chicken in them, and my fussy dog really loves them. I have given her the cheaper knockoffs, and she would not even eat them. She loves the Dingo treats with rawhide and chicken! Keeps our puppy busy and happy! Our Mazie loves her Dingo bones as did all the dogs we ever loved. Reliable product. I have two hound dogs. They both love these. The beagle is especially fond of her bones. I will order my bones this way all the time. It was cheaper to order in bulk with free shipping. My dog Molly loves these bones. Our dog loves his morning Dingo. The day will not start with out it. He sits up and dances for his treat. We have a Westie terrier and she loves Dingo bones. When we run out and throw the bag in the trash, she retrieves the bag and runs around with the bag on her snout. My dog is addicted to these things. If you say the word bone, she comes running and stands in front of the cabinet where they are. Mr. Peanut loves his dingo treats! When Mr. Peanut starts barking at the cabinet where we keep the Dingo treats, he won't move until we give him one! He loves them!!!! We have two French Bulldogs and a pug. They prefer this treat over any other I have found. We can't run out of Mini-treats!! Our mini-Schnauzer HAS to have his mini-Dingo chew treat after his supper, so that we can eat our meal in peace! Seriously, he loves them and it is an expected highlight of his day. I don't know what we would do if they weren't available! 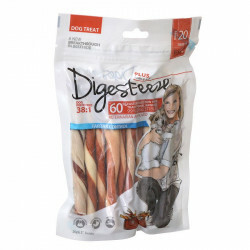 I have two large dogs and instead of going with the big bones everyday, they luv these mini bites and I don't have to worry about too much rawhide in their diet. And they are just the right size not to be a choke hazard. My best friend Tipsie gets one of these every night. If I forget to give him one by 8 PM he is sure to remind me. Just like clock work. We have two Rat Terriers and they both just love the mini bones. They have one in the morning and at least one more before the day's over. When we go to the closet they get so excited and can hardly wait to run of with their bone. My 2 little dogs love these dingo bones. Keeps them busy for a while. The price is the best I can find anywhere. I give my large and small dogs these mini bones as an occasional treat, and they love them. It keeps them busy and helps keep their teeth clean.